British brand Atkinsons has launched 41 Burlington Arcade, a new fragrance. 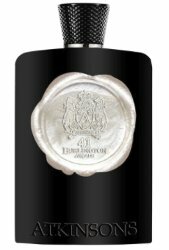 Encapsulating the spirit of today’s Mayfair, Atkinsons 41 Burlington Arcade Eau de Parfum – named after the perfumer’s latest store – is enriched with citrus notes of lemon and grapefruit. At the heart is bittersweet liquorice while the base’s smoky fusion of cedarwood and amber create the fragrance’s sensual accords. Underlying floral scents keep the fragrance fresh and daringly individual. Additional notes include white pepper, bay, cardamom, nutmeg, pimento, vetiver and musk. Atkinsons 41 Burlington Arcade is available now at Selfridges, £210 for 100 ml Eau de Parfum. I visited the Burlington Arcade in October 2016 as a “perfume tourist” and it was heaven! All the sales associates in each boutique were so knowledgeable. It seems as if it has become perfume Mecca in London, and that’s a beautiful thing. Yes — not surprised that’s where they put their store!